How Does Dynamic Range Compression Change Audio? Dynamic Range Compression is used in everything. Most audio editors have a “compressor effect,” and mastering it can mean the difference between an amateur and pro-level mix. To understand how it works, we need to see what exactly it does. First of all, this should not be confused with general “audio compression,” which is data compression and covers things like MP3 conversion. We’re most definitely NOT talking about compression of quality for space-saving reasons. If that’s what you’re looking for, check out HTG Explains: What Are the Differences Between All Those Audio Formats? We are talking about compression of the dynamic range of sound in an audio track. If you record a pin-drop followed by a TNT explosion, you’ll notice that there’s a very large difference in the intensities of those two sounds. That’s what we refer to as dynamic range. Now, our ears are pretty good at working with large differences like that, but audio equipment isn’t. If you ever watched a war movie where the actors’ dialogue was drowned out by gunfire, then you know what I’m talking about. Granted, that would be difficult to hear in real life as well, but the audio equipment involved in the process makes it pretty unintelligible. That’s where a compressor comes in. 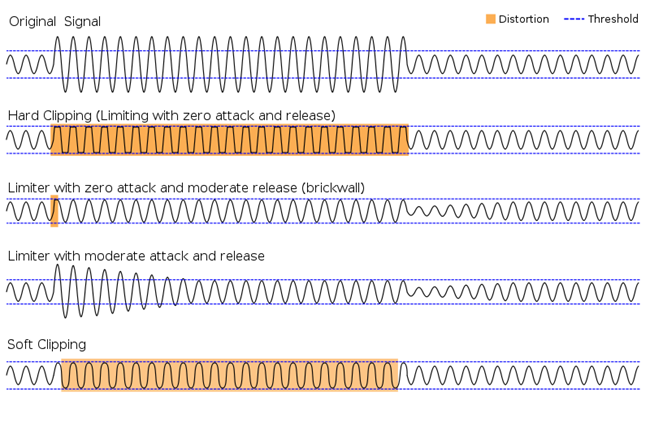 The image above shows a rack-mounted compressor, which will take an audio signal and adjust it based on several parameters. It’s a lot like having a personal audio engineer that will constantly adjust the signal to where it “should” be, as it’s running through the system. Compressors are usually physical devices that process signals that can be chained to other effects and processors, but the effect can also be applied via software. You can adjust the levels he starts to turn the knobs at, how quickly he acts, and how much compression is applied over what time period, but that’s what his focus is limited to. This reduces the dynamic range in predetermined ways so that the result is uniform audio, or at least audio whose loud and soft ends are much closer to each other. Compressors can be used for artistic effect, too. It can enable singers to whisper just as loud as the distorted guitar. This result that wouldn’t really work as well by just adjusting the volume, especially if the singer suddenly switched from whisper to all out scream. Let’s take a look at some examples. Listen at around 0:43 for the bass drum; you’ll heard the rest of the track’s volume drop. Listen for the lead singer’s high-powered vocal at 0:22, and a low-powered one at 1:29. At 22 seconds in, you can hear Amy Lee push a high-powered vocal that’s close to a scream, but it sounds muted. At 1:29, you can hear the layered background vocals being whispered, but the volume is normal. And, of course, you can hear that pumping effect while the audience is clapping throughout the video. Both of these examples show what DRC can do in isolated circumstances, i.e. as an effect on a particular clip. It’s somewhat harder to illustrate how compression is utilized in its more mainstream usage. DRC works well as a more advanced volume limiter that prevents the signal from clipping, which can distort the sound quality and damage sensitive equipment. It’s universally used to smooth out an audio track so that when an equalizer is applied afterwards, you reap more of the benefits. DRC is also used in movies so that in loud scenes, you can still hear the actors’ dialogue, or so that the dying whisper of a victim is still loud and clear after the gunshot that ended him. It can still preserve some of the dynamic effects, however. Let’s take the example of a band. The drums are a really dynamic and overall loud part of a band. If the drum track is uneven, it’s pretty noticeable. Say the drummer’s tired or makes some slight mistakes throughout the track. Some parts of the track will have louder bass kicks than others. Using a compressor will even that out so that the lighter kicks will be just as loud as the normal ones, and the harder kicks will be toned down a bit. Snares can also by toned down by dampening the initial strike, thus allowing the “crack” that follows to become more prominent. On a bass guitar, the higher notes will be louder and punchier than the lower ones. A compressor will keep the low tones loud and higher ones soft. On the other hand, when you use slaps to accent, you can keep them from spiking too high and being distracting, but still keep them sharper than the normal bass notes. You can also increase how long the note is sustained at a higher volume. Guitarists often can get carried away with their playing. Compressors can make sure that the lightly plucked or strummed notes stay light and the heavier ones stay loud. After a certain point, heavy strumming starts to distort the audio. Setting the compressor’s threshold – more on that later – to less than that will prevent entranced guitarists from messing up the track. You can also alter the sustain. In the same vein as the bass guitar, singers tend to sing louder at higher pitches and softer at lower pitches, depending on their range. You can keep the singer’s pitches even without requiring the singer to put more or less power behind them. 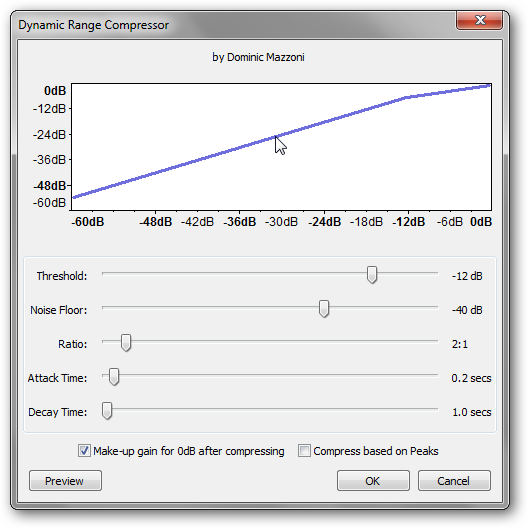 In these ways, dynamic range compression can be used to smooth out smaller fluctuations in performance by artists. This allows a more uniform sound but still allows musicians to deliberately emphasize certain notes and cadences. It doesn’t get rid of the dynamic range of sounds completely, it just makes it so that the musician has to put more effort into it. All of this is especially important at live shows where performances are highly variable and much more sensitive to the performers’ stamina and frame of mind. Listen to the first 20 seconds, focusing on the change between the intro and the rest of the song. In this example, the Cancer Bats decided to compress the dynamic range over the whole song, not one particular track. Pay close attention to the end of the intro, at around 14 seconds in. The guitar is loud when it’s in focus, but as the rest of the instruments kick in, it drops down and mixes in. The overall volume of the song doesn’t change through the transition. You’ll hear a bit of pumping, too, but not as much as in the other songs. Unless this is the specific effect you’re going for, this is often considered a “poor” use of compression. Listen to the end of the solo intro at about 0:07. Ultimately, it depends on what you want. Professionals say that compression should be used on each individual track, then if needed, over the final track as a whole. Dynamic range is good because it adds flair, nuance, and color to audio. Compression is used to illustrate that where musicians want it to be, and that’s done by reducing variation elsewhere. On the other hand, compression can add its own effect to audio. Several artists and even the majority of some genres use this for a specific feel, as an artistic effect. Compressors are built in different ways. Some use tubes, others use valves, some use light sensors and LEDs, and the cheaper ones use solid state parts. Different types of DRCs will “color” the sound differently, albeit slightly. The goal isn’t to change the sound itself, of course, but having an expensive tube compressor that makes the audio sound warmer certainly won’t hurt. Whether cheap or expensive and regardless of the mechanism, they all work to see the signal and adjust the volume. Compressor effects essentially mimic hardware compressors; above you can see the pane for the compressor effect in Audacity. Both focus on a handful of parameters. Threshold: This is the level at which the compressor will act. This can be set to the minimum or maximum volume, but it’s more commonly used as a guide post at which the compressor enacts changes. After this point, increases (or decreases, if used to bump upwards) in volume are significantly dampened. Ratio: This is ratio by which the exceeding output is reduced. A 20:1 ratio will reduce whatever exceeds the threshold by that much, so 20db over the threshold will come out of the compressor as 1db over. Because the decibel system is logarithmic, this is has a much more pronounced effect on the volume. Really high ratios, like 20:1, 60:1, or infinity:1, effectively hard limit the volume. Attack: The signal isn’t altered by the compressor immediately; there’s a slight delay. Attack allows you to control this delay. It’s measured usually in milliseconds, so higher values will allow spikes of volume through the threshold before behind compressed, making guitars sound more punchy. Lower values will help with hard limiting. Release: Compressed sound can be immediately returned to their actual volume or they can held at the threshold for longer. Using a higher value for release will help increase the “sustain” of a guitar or bass, allowing for notes to be held out much longer. Knee: The Attack dictates how quickly the compressor will act on a signal that exceeds the threshold. Knee dictates how quickly the compression is applied to that signal. A “hard” knee means that as soon as the compressor acts, it fully compresses the signal. This works well when using the compressor as a volume limiter. A “soft” knee will gradually build to using full compression. This keeps vocals sounding natural despite using compression. 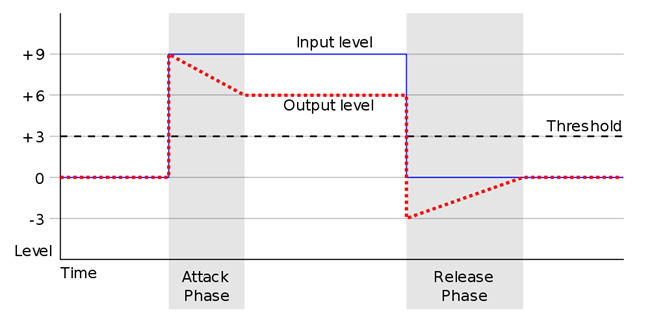 Output: This is the output level, which can be modified. After compressing a track or signal, it can be brought back up to its full volume or cut to a lower one. Different instruments sound more “natural” with specific settings, of course. Do some research online and use your ear to experiment until you find the sound you want. You have to ask yourself “What does my track need?” Now that you know how dynamic range compression works, you can tinker with the sound for yourself. If you’re looking for more info, there’s a great post on the Seven Strings guitar forum on DRC.